In today’s interview, I get to speak with qualified pharmacist (dubbed The Renegade Pharmacist) and holistic wellness expert, Niraj Naik, about the power of breath in changing ones physiology to promote healing and wellbeing. Niraj is very passionate about helping people achieve health and recover from chronic diseases through changes in lifestyle, diet and the power of breath. Due to his background as a pharmacist, Niraj saw first-hand that medications often don’t work at resolving the root cause of the problem. What’s worse they cause unpleasant side-effects and a need for more medication to temper these. His search for alternative methods to improve health led him to uncover ancient holistic methods. Today we get a chance to talk about the breathing exercises, in particular, the pranayama breathing technique and how we can use our breath to help change our physiology for the better. If you know someone who is interested in learning more about over-breathing, oxygenative stress and how practising breathing in different ways can improve health and wellbeing, this interview is for them. I really enjoyed this interview with Niraj as he shared some practical tips and demonstrated a breathing technique anyone can implement today for stress and anxiety management. I also find particularly useful him explaining the science behind why these ancient breathing techniques work. Special thanks to Niraj for joining me on the show. Enjoy the episode! To find out more follow Niraj on Instagram and YouTube or visit one of his websites, The Renegade Pharmacist (great advice on alternative medicine) or Soma Breath (for more on 21 Day Awakening Breathwork Protocol). [00:19] – Introducing, Niraj Naik, a qualified pharmacist and holistic wellness expert. Niraj became known as The Renegade Pharmacist during his time in the head office of one of the largest supermarket chains in the UK when corporate management considered his idea of a healthy shopping list as too risky for business. 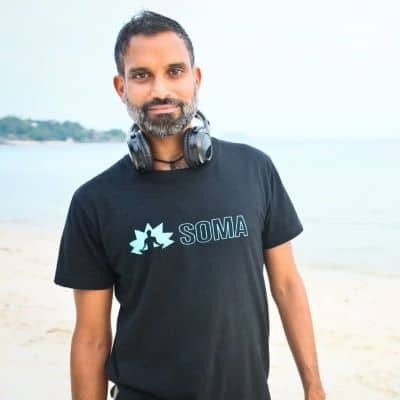 [00:52] – Niraj doesn’t rely on drugs for his well-being and is very successful at getting people off their medication through diet, lifestyle and pranayama breathwork exercises. Today we will focus on breathwork training. He explains there are many different styles of breathwork. [02:35] – Corporate stress took a toll on Niraj’s health and led to ulcerative colitis. He explains how back then his ideas on diet and lifestyle being key to health were not taken seriously and how his swami taught him that the opposite of conventionally held beliefs is true. [05:01] – Niraj explains the science of why we need to breath less and use oxygen more efficiently in order to cause less stress in the body. According to pranayama we must always breathe through the nose (our filter). [07:50] – Over breathing is triggered by stress. Our emotional responses trigger the same responses and increased demand for oxygen (that isn’t actually needed) as physical stress. [10:01] – In the modern world we are constantly bombarded by stress and negativity. Niraj explains there are ways we can consciously control our autonomic nervous system by controlling our breath. Breathing erratically also disrupts our heart beat. [11:53] – Normal breathing involves breathing through the nose and into the belly, in a relaxed rhythmic manner. Breathing through the mouth stimulates more of a chest response and should be reserved for exercise and talking. [13:35] – The ancient yogis, who knew all about the importance of breath, created pranayama which means energy control. We are all connected through the fact we all breath and people can often start to match each others breathing. [14:30] – Pranayama is a prescription of different breathing techniques based on the knowledge that too much oxygen is like fire in the body. Niraj explains how this works within the cell and can cause oxidative damage. It is key to get the balance of oxygen right. [15:55] – The theory is that the more efficient you are at using oxygen the less you need; therefore reducing the risk of damage of cells, mutations, cancer and other diseases. You will also look younger and be healthier. [17:05] – Niraj explains how the Russians did a lot of studies exploring why people who spent some time in high altitudes report feeling better and have some reversal of symptoms. Athletes also get fitter. Yogis knew that rhythmic breathing followed by breath retention simulates the same affect. [18:11] – Normal breathing is related to rhythmic breathing, but breathwork involves consciously modulating the breath in order to affect the physiological change in the body. This changes the oxygen/carbon dioxide ratio. Other than pranayama, what are some alternative modern breathing techniques and what is the danger of using these? [20:24] – Therapeutically when would you use intermittent hypoxia vs the hyperbaric oxygen chambers (HOC)? Niraj explains that, other than speeding up the healing of wounds/skin diseases, HOC have no proven health benefits. [23:38] – Niraj explains that panic and anxiety is like a vicious cycle. He explains where these emotions come from and the biological processes behind these states. Biohackers Lab tip: To help stop anxiety, extend exhalation or do ohms watch the YouTube video of this interview for a demonstration of how to breath to relieve anxiety). [34:56] – In time, using these breathing techniques, you will become more efficient at using oxygen and extend the length of your ohms. Niraj explains that the length of time you can hold your breath/chant ohms is a measure of your vital capacity/ability to use oxygen. [35:36] – Because there are lots of different breathing techniques it is good to know when and how to apply each one e.g. you wouldn’t do the hyperventilation technique every day. Treat these techniques like a drug, as they change your physiology. [37:50] – Pranayama is a technique you can use daily. Niraj explains how you can use the 21 day protocol he’s created for getting all the benefits of these techniques. [45:29] – Asthma response is produced to suppress/reduce the oxygen flow into the body. Asthmatics will benefit from these techniques, especially. [48:08] – To keep in touch or find out more, visit Niraj’s website The Renegade Pharmacist which has great advice for alternative medicines to drugs. Soma Breath website is a great source for all things breathwork including a webinar and the 21 Day Awakening Breathwork Protocol.